There’s no point denying it. When it was originally aired, I watched every episode twice. In the UK, Channel 4 showed an episode and then straight after, their sister channel E4 played the next episode, which would be shown on Channel 4 the week after. This basically meant that the audience got to watch two episodes back to back, and the refresher before a new episode was great because, let’s face it, Lost is complicated. That’s exactly what I love about it. I get bored with straightforward TV dramas. I despise reality TV and can’t stand soap operas. I want more. I need more. There’s never been another show that has caught my heart quite like Lost has. I loved to analyse the episodes with friends and colleagues afterwards. It’s a blink-and-you-miss-it kind of show, so someone had always spotted something I had missed. Even now, re-watching it for the umpteenth time, I still catch little bits of information that I hadn’t noticed before. It’s not just a genius of a plot; it touches me on many emotional levels too. It makes me laugh, cry, sit on the edge of my seat and look at the TV screen through my fingers. I spontaneously scream, “What?? !” when something unexpected happens - and that’s often. 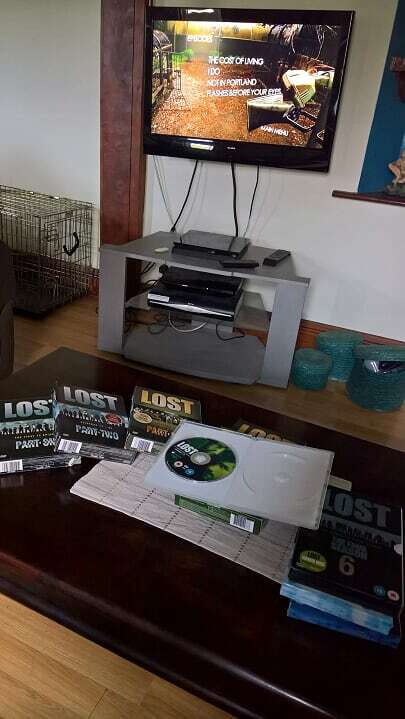 So yes, if you haven’t watched it yet, please do yourself a favour and watch Lost. You won’t regret it. I know lots of people who have given up after two or three seasons. Oh ye of little faith. Keep going. It’s worth it in the end.